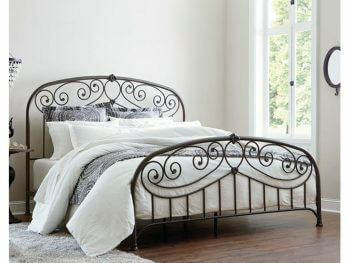 Lillian Metal Bed has a beautiful shape with its round top frame and scroll panels. Delicate leaf castings and a blackened finish lend a timeless romantic air to this graceful beauty. Traditional Styling. Rounded top frame, scrolled panels. Scrolled leaf castings. Blackened finish with rubbed tips. Tubular metal bed.